Brand new in Bandcamp, we have the debut LP of Denver's appropriately-named Crafteon, a black metal band bringing to life the time-honored themes of HP Lovecraft. Of course, the stories by the master of cosmic horror aren't exactly new in any genre of heavy metal. What makes these guys any different? Perhaps it's the way they bring it to life. The band's leader, Vacant Throne founder Josh Mortensen, aka Lord Mordiggian, is better known for power metal cheesiness than black metal minimalism, but carries the incongruous workload without difficulty. As it is, this is more melodic than a lot of black metal, even if every member of the band wears corpse paint and names himself with a vaguely evil-sounding alias (naturally, the aliases are Lovecraftian, not Satanic). The lyrics, delivered in a rough but intelligible voice that bears some resemblances to Abbath's, are carefully crafted to keep the tone of the stories as originally conceived by Lovecraft central to the song, which does a good job of keeping the sense of dreamlike horror the stories could evoke. Crafteon does a good job of keeping the songs varied, from mid-tempo tremolofests such as What the Moon Brings, one of my favorites, to doomy marches such as The Colour out of Space. Atmosphere-wise, the band nails it better on the mid-tempos than the slow ones, but throughout, the combination of hushed croaks with sullen blackened riffing works nicely to evoke the tentacled monstrosities described as well as does the lovely cover with Cthulhu roaming about the sea. Another standout is White Ship, containing some great lead riffing midway through as well as a clean but sepulchrally deep chorus. 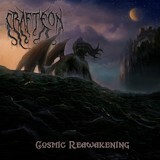 Cosmic Reawakening is a melodic black metal album that succeeds in getting the Lovecraftian atmosphere across in a smooth sound that's easy to listen to. It's hard to tell whether this is a one-off project or if the group has more albums in their future, but this one is good.